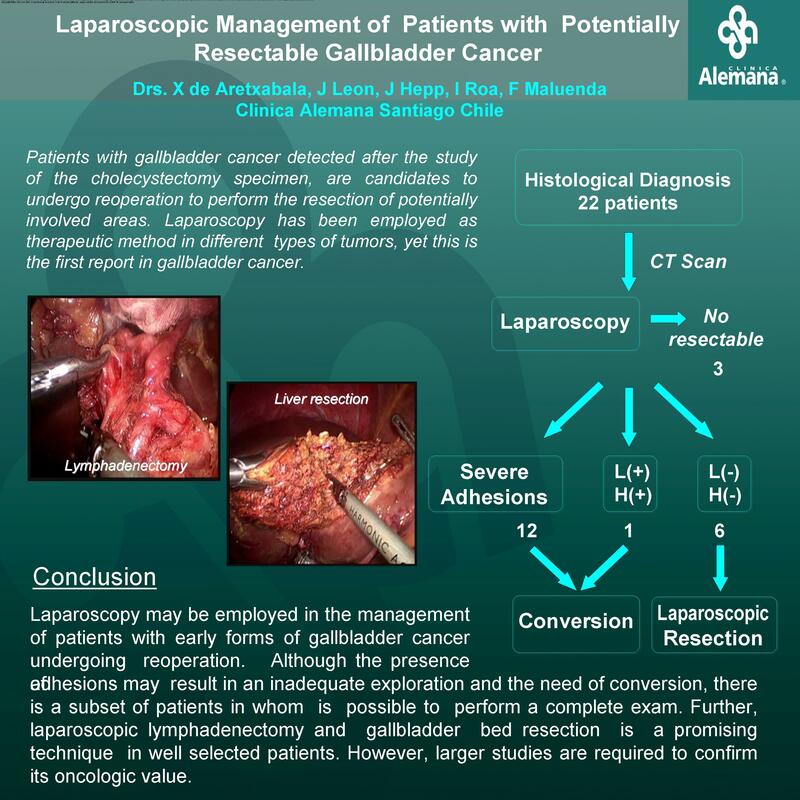 INTRODUCTION: Laparoscopy can represent an useful tool in the management of patients undergoing reoperation for gallbladder cancer detected after the study of the cholecystectomy specimen. The aim of this study is to evaluate the feasibility and outcome of a series of patients undergoing initial laparoscopic management . RESULTS: All patients underwent laparoscopic reoperation. Intervention was finished after the initial exploration in three patients. Of these, in one patient peritoneal recurrence was observed while the other two patients did not have a good general condition to perform the resection. Conversion to an open procedure after a negative exam of the abdominal cavity was performed in 9 patients. Of these patients, in three the open exploration allowed the detection of metastatic tumor undiscovered during the laparoscopic procedure. Main cause of the lack of detection was the presence of dense adhesions in the subhepatic area that made difficult a complete exam. In the rest of patients and after a negative open exploration a lymphadenectomy associated with the resection of segments IVb and V was performed. In four patients and after a negative laparoscopic exploration, the resection by laparoscopy was attempted. Carbon dioxide pressures were maintained between 8–12mmHg. In general, 5 ports including two 10/12 ports were employed. Of these patients, in three a complete lymphadenectomy of the hepatic pedicle associated with the resection of the gallbladder bed was performed . In the other patient, the presence of a metastatic lymph node in the hepatoduodenal ligament was the indication to finish the resection after conversion . Laparoscopic liver resection was performed using harmonic and stapling for large vessels. Surgical specimen was extracted through an enlarged port. Neither postoperative morbidity nor mortality was observed in the series . Perioperative blood transfusion was not employed in any of the patients. Among those undergoing resection, recurrence was observed only in one patient, while the rest of patients are alive and free of recurrence with a complete follow-up. CONCLUSION: Laparoscopy may be employed in the management of patients with early forms of gallbladder cancer undergoing reoperation. Although the presence of adhesions might result in an inadequate exploration, there is a subset of patients in whom is possible to perform a complete exam. Further, laparoscopic lymphadenectomy and gallbladder bed resection is a promising technique in well selected patients. Larger studies are required to confirm its oncologic value.